(Rick Egan | The Salt Lake Tribune) Coach Kyle Whittingham talks to the team during practice. Whittingham is entering his 14th year as Utah head coach, Wednesday, Aug. 15, 2018. (Rick Egan | The Salt Lake Tribune) Coach Kyle Whittingham greets his players during practice. Whittingham is entering his 14th year as Utah head coach, Wednesday, Aug. 15, 2018. (Rick Egan | The Salt Lake Tribune) Kyle Whittingham is entering his 14th year as Utah head coach, Wednesday, Aug. 15, 2018. (Steve Griffin | The Salt Lake Tribune) Utah head football coach Kyle Whittingham keeps and eye on the action during the University of Utah football team's first scrimmage at Rice-Eccles Stadium in Salt Lake City Friday March 30, 2018. (Francisco Kjolseth | The Salt Lake Tribune) University of Utah football coach Kyle Whittingham speaks with the media following the retirement announcement by Athletics Director Chris Hill during a press event at the Jon M. Huntsman Center on campus on Monday, March 26, 2018. Utah head coach Kyle Whittingham high fives fans after the Utes win over theColorado Buffaloes, in PAC-12 football action Utah Utes vs. Colorado Buffaloes at Rice-Eccles stadium, Saturday, November 25, 2017. (Chris Detrick | The Salt Lake Tribune) Utah Utes head coach Kyle Whittingham during the game at Rice-Eccles Stadium Saturday, October 21, 2017. Arizona State Sun Devils defeated Utah Utes 30-10. (Trent Nelson | The Salt Lake Tribune) Utah Utes head coach Kyle Whittingham as the Utah Utes host the San Jose State Spartans, NCAA football at Rice-Eccles Stadium in Salt Lake City, Saturday September 16, 2017. (Rick Egan | The Salt Lake Tribune) Brigham Young Cougars head coach Kalani Satike hugs Utah head coach Kyle Whittingham after BYU was defeated by Utah, 19-13, at Lavell Edwards Stadium in Provo, Saturday, September 9, 2017. (Trent Nelson | The Salt Lake Tribune) Utah Utes head coach Kyle Whittingham high-fives fans after the win as BYU hosts Utah, NCAA football in Provo, Saturday September 9, 2017. (Trent Nelson | The Salt Lake Tribune) Utah Utes head coach Kyle Whittingham prepares to take the field as BYU hosts Utah, NCAA football in Provo, Saturday September 9, 2017. (Chris Detrick | Tribune file photo) Utah Head Coach Kyle Whittingham watches as his team moves down the field as the Utes face BYU in the third quarter at Rice-Eccles Stadium Saturday, November 27, 2010. (Steve Griffin | The Salt Lake Tribune) University of Utah football coach Kyle Whittingham answered questions during the Utes' weekly press conference at the football facility press conference room in Salt Lake City Monday August 28, 2017. (Steve Griffin | The Salt Lake Tribune) University of Utah football coach Kyle Whittingham makes a few statements during the Utes' weekly press conference at the football facility press conference room in Salt Lake City Monday August 28, 2017. Francisco Kjolseth | The Salt Lake Tribune Michigan Wolverines coach Jim Harbaugh shakes hands with Utah coach Kyle Whittingham before the start of the game at Rice Eccles Stadium on Thursday, Sept. 3, 2015. Chris Detrick | The Salt Lake Tribune Utah Utes head coach Kyle Whittingham arrives for the game at the Los Angeles Memorial Coliseum Saturday October 24, 2015. Scott Sommerdorf | The Salt Lake Tribune Utah Utes head coach Kyle Whittingham talks with his team prior to the Utah - Arizona State game, Saturday, October 17, 2015. Franciso Kjolseth | The Salt Lake Tribune University of Utah head football coach Kyle Whittingham gets his team ready for the season during Spring no pads practice at the Spence Eccles Football Facility on Thursday, April 17, 2014. Scott Sommerdorf | The Salt Lake Tribune Utah head football coach Kyle Whittingham shows off his U jacket lining as Rep. Jim Dunnigan, R-Taylorsville, left laughs in response. BYU head coach Kelani Sitake and Whittingham visited the House and caused quite a stir on the floor as Rep. Carol Spackman-Moss was trying to present her bill, HB221 - Immunization of Students Amendments - in the Utah House of Representatives, Thursday, March 3, 2016. Scott Sommerdorf | The Salt Lake Tribune Utah head coach Kyle Whittingham gets congratulated by his wife Jamie after Utah defeated BYU 24-21, Saturday, September 15, 2012. Chris Detrick | The Salt Lake Tribune Utah Utes head coach Kyle Whittingham enters the stadium before the game at Martin Stadium at Washington State University Saturday November 19, 2011. The game is tied 7-7. Chris Detrick | The Salt Lake Tribune Utah Head Coach Kyle Whittingham argues a call during the first half of the game at Rice-Eccles Stadium Saturday November 6, 2010. TCU is winning the game 23-0. (Francisco Kjolseth | Tribune file photo) Salt Lake City - Utah's Stevenson Sylvester, coach Kyle Whittingham and quarterback Brian Johnson, from left, and Clint Mower, below, greet the crowds as the University of Utah's unforgettable 2008 football season officially ends on Friday, Jan. 16, 2009 with large crowds of fans descending on downtown Salt Lake City for a team that won 13 straight games in every conceivable manner. Scott Sommerdorf | The Salt Lake Tribune Utah head coach Kyle Whittingham and Utah quarterback Brian Johnson (3) hold their trophy aloft after the Utes defeated Alabama in the 75th annual Sugar Bowl in New Orleans, Friday, January 2, 2009. Utah head coach Kyle Whittingham and defensive coordinator Gary Anderson celebrate after the Utes defeated Alabama in the 75th annual Sugar Bowl in New Orleans, Friday, January 2, 2009. Scott Sommerdorf/The Salt Lake Tribune Scott Sommerdorf | Salt Lake Tribune UTAH at OREGON Even after a tough loss to Oregon, Utah Head Coach Kyle Whittingham was able to give an optimistic thumbs-up to the Utah student section that had come to Eugene to cheer for the Utes. Utah lost to Oregon 31-24, Saturday 9/19/09 Salt Lake City - Utah's Stevenson Sylvester, coach Kyle Whittingham and quarterback Brian Johnson greet the crowds as the University of Utah's unforgettable 2008 football season officially ends on Friday, Jan. 16, 2009 with large crowds of fans descending on downtown Salt Lake City for a team that won 13 straight games in every conceivable manner. Photo by Francisco Kjolseth/The Salt Lake Tribune 01/16/2009 THE WHITTINGHAMS Utah head coach Kyle Whittingham playfully pinches the chin of one of his nieces as she was asking him if they could jump onto the field after Utah defeated San Diego State 63-14. Scott Sommerdorf / The Salt Lake Tribune UTAH at UTAH STATE Head coach Kyle Whittingham and QB Brian Johnson confer during a timeout in the first half. The Utes held a 30-7 halftime lead after being behind briefly at 7-0. Scott Sommerdorf / The Salt Lake Tribune UTE PRACTICE Utah head coach Kyle Whittingham walks off the field after the University of Utah practice at the Superdome Wednesday, 12/31/08. Scott Sommerdorf / The Salt Lake Tribune COACHES PRESS CONFERENCE Utah coach Kyle Whittingham (R), and Alabama coach Nick Saban met and posed for photos with the Sugar Bowl trophy at a press conference, Thursday, 1/1/09. Scott Sommerdorf / The Salt Lake Tribune (Rick Egan | Tribune file photo) Defensive coordinator Kyle Whittingham coaches the Utes defense on a snowy day in Provo against BYU on Saturday November 22, 2003 at LaVell Edwards Stadium. Rick Egan | The Salt Lake Tribune Kyle Whittingham talks to the defensive on the sidelines of the Utah football game against Washington State on September 4, 1999. On the west side on the island of Maui, where Kapalua Bay bends like a horseshoe and waves crash on the welcoming sand in Kaanapali, a man defined by unrelenting purpose tries his best to unwind. That place, surrounded by family, is where Kyle Whittingham comes as close as he can to tranquility. Other than a raucous Rice-Eccles Stadium, a beach in Hawaii is the coach’s favorite place on earth. “Cleanses the soul,” he says. Each July, in the last weeks before the University of Utah football coach returns to campus for the start of preseason camp, Kyle and his wife Jamie take their kids and grandkids to Maui. They have gone there for years now. It’s tradition. At first, each trip featured the usual tourist-traps. Now, they go and relax. Maui is fit for perspective. For family. For golf. It is for snorkeling around sea turtles, for hearing the Pacific Ocean roar, for watching the grandchildren play in the sand or outrun the water moving further up on shore. It’s also a training exercise for the suddenly not-so-distant future. This is all a precursor for the day when Whittingham doesn’t have to be concerned about an opposing quarterback or the health of his offensive line. This annual retreat is practice. He is approaching 60, and the idea of retirement is no longer an abstract thought. I have seen Kyle Whittingham the Coach, the leader of one of the most stable Division I programs in the nation, on the practice fields during fall camp. He is strict, stern, in control of everything. I have also seen the pictures and heard the stories of Kyle Whittingham the Husband and Father and Grandfather, cutting loose in paradise, teeing off, riding a ski lift up a mountain. And I wanted to square the two versions of the man. When I arrived for my interview, it struck me quickly that I would be talking to the Coach. Somehow, being less than 10 minutes early felt like being late to chat with the 58-year-old who rarely takes time for 1-on-1 interviews — let alone discussions about life away from football. It is just before 5 p.m. on a Tuesday and inside Utah’s state-of-the-art complex the hallway is dark, but every office is filled with coaches, eyes fixed on their laptops. His office is at the end of the hall. In perfect line of sight is the stadium, Whittingham’s other office, where over the past 13 seasons as head coach, he has become a University of Utah legend. As he prepares for his 14th season, football consumes him. It always has. tenured head coach across college football. He has won 111 games and lost 56. He is an astounding 11-1 in bowl games, one of which resulted in a perfect season. But he yearns for that elusive Pac-12 South title and a shot to hoist a different conference crown. Over these past three decades, though, Whittingham has come to realize that to reach the next stage in the evolution of the program, those precious moments of life away from the game are just as important. That is the taxing part of life as a head coach. Knowing it’s impossible to perfect the balance between those nights under the lights and everything before and after, but also knowing that no matter what, you have to try. Whittingham does not sleep well. His mind won’t turn off. The demands of the job program your mind to be ready to respond to whatever developments arise. It’s a byproduct of being in charge of hundreds of other people, not only in the intense time frame of a season, but 12 months a year. On average, he gets about 5 to 6 hours of shut-eye. It’s better than it used to be. His early years as a head coach were agonizing, overwhelming, all-consuming. Kyle said it took him at least three years to understand how to handle everything that comes with the job. He thought it was all X’s and O’s back then, making sure practices were crisp and the preparation spotless. Instead, he learned about another vital part. It took a little longer for the coach to apply that to his own life. He credits Jamie for much of this ongoing transformation. When he walks through the door after another lengthy day of work, she isn’t asking about how the first-team offense handled the red zone. Alex Whittingham remembers his dad getting home just early enough each night to get a rundown of everyone’s day before prep for the next day began. “There’s always a season,” the coach says. There’s so much to attend to, to make sure everything is done, to tied off potential loose ends every day. And then you do it again. It’s an ongoing battle familiar to the Whittingham family. The family patriarch, Fred, taught his kids to leave work at work, as much as possible. Don’t let your mind be other places. Be present always. Kyle Whittingham looks back and cracks a smile. He remembers now how football could’ve been a round-the-clock topic even as a teenager or later as a college student. Fred, he said, had the presence of mind to let it go. As the seasons have stacked up like bowl trophies inside the Utah football complex, trying to let go when the time calls for it has provided Whittingham with a clearer perspective on that balance he’ll always strive for. There is indeed a Whittingham Intensity Index, Brady confirms. There are varying levels. Fred remains at the top. Kyle is a close second. It’s been 15 years since Fred died. When asked what he misses most about his dad and mentor, Kyle, back in his office, a towel around his neck after a workout, pauses. The kind of pause necessary to ward off tears. One of Whittingham’s closest friends has noticed a shift. Gary Andersen returned to Utah after a decade away and has seen in the eight months back on campus that Whittingham is still adapting — on and off the field. You never really walk away or get to unplug entirely, but Whittingham has a structure and a staff in place to realize that when it’s time to go dark, to board a plane for some place for anything other than football, it’s time. And when he gets time off? “He goes hard,” says his son, Alex. When it’s warm out, Whittingham is golfing. If he had 50 days to golf, Brady deadpans, he golfed 50 rounds of 18. A decade ago, he used to tease Brady that golf was a waste of time. Now, he can’t get enough of it. He’s played Pebble Beach and wants to play in the annual celebrity golf tournament in Lake Tahoe every July. Earlier this summer, he tuned in live and was texting former Utah coach Urban Meyer, telling him he wants in. “Brutally bad,” is how Whittingham described his game at first. “Just horrible.” Now, he can play to a 12-handicap. Not good, he said, but it’s progress. He’s determined to win every time he steps on the course, though. Each putt can have stakes beyond the scorecard. When the mountains are capped white in the winter, Whittingham starts the app on his phone that clocks how fast he can zip down the mountain. Snowbird is his resort. He used to be able to get from his driveway into his boots in 14 minutes, but the Whittinghams recently moved. Jamie said a benefit to skiing is that just like her husband’s playing days so long ago, he’s covered up. His favorite run is Think Young, but to him, it’s still Anderson’s Hill. It’s a black diamond run. Whittingham wants to be the fastest. “He’s got to be the best at what he does,” says Alex, now a defensive assistant coach with the Kansas City Chiefs. They talk every day, and when Alex and his dad riff on what transpired throughout their respective days, Whittingham will ask Alex what time he got to work and how late he stayed. He brags a bit the days he stays later than his son. It’s also pursuing new things. Kyle and Jamie have gone to Europe twice in recent years. Utah football gear has been sported in London and Paris, across Germany, Austria, Switzerland and Italy, and later in the Mediterranean. The way he tells it, he’d love to go back. And the way he tells it, you get a sense that Andersen is right: Fifteen years ago, Whittingham probably wouldn’t have been wearing the drum-and-feather on a cruise ship around the island of Malta. Then, of course, there’s Maui, where he does it all. Except for surf. He only does things, his family says, that he has a chance to be really good at. 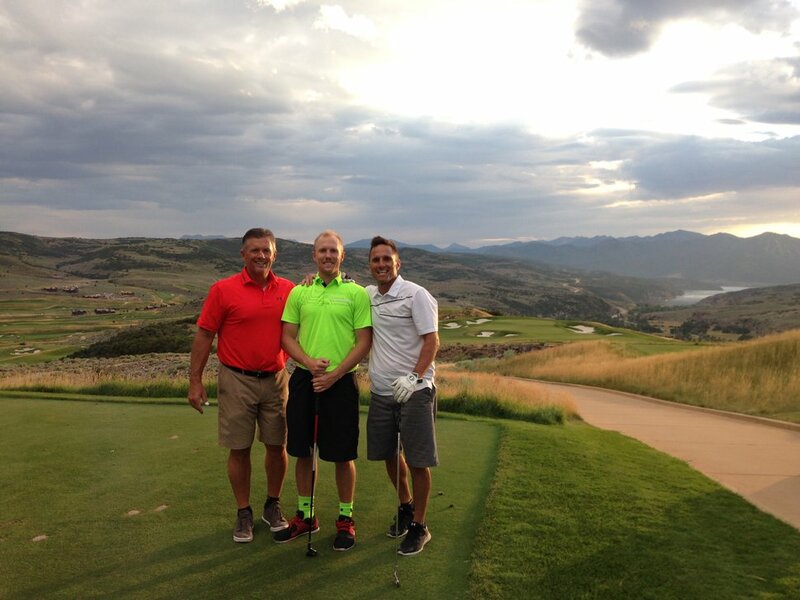 Photo courtesy Brady Whittingham: Utah coach Kyle Whittingham golfing with son Tyler and brother Brady. My nervousness around being early but not too early to meet with Whittingham in his office is later validated when I am talking to his family, and Brady shares this anecdote: Utah road trips are detailed down to the minute of every day. Schedules are passed out to every coach, player and staffer. Some things never change, but others do. His intimidation factor hasn’t waned. His beard may be more gray, but don’t mistake age for fading fire. His workouts remain a thing of lore, and Utah’s social media accounts are still ripe with exaggerations of his otherworldly calf muscles. “He hasn’t missed a [workout] day in like 3,000 days or something,” Jamie says, noting Sunday is the only day off. Perhaps nothing’s affected him like becoming a grandfather. It’s there, in those moments, where he can run counter to everything he’s been his whole life. There, he’s a bit of a rule-breaker, nothing close to the proprietor of Pac-12 program, like sneaking Missy’s daughter some ice cream and grinning just as wide as granddaughter, Remi, when they’re caught. It’s where when he’s still down following a heart-wrenching loss, he aims the motorcycle ride he and Jamie are on toward Missy’s house to wish the grandkids good night 10 minutes before bedtime. “He is just adoring to them,” says Missy. As he’s said, you never master it. You try, though. Because when you’re a football lifer raised in the game by a man who showed you how it’s done, you know that as much as you love it, as much as you crave it, football is not everything. He has plans. He wants Utah to win the Pac-12 South. To make noise, upset the established order, to wrap up the unfinished business. So, when approached with the question that will be posed more the longer his tenure continues, he says he has no fear of retirement. There will be more runs to rip down, more chips out of the rough, more ice cream cones to share with his grandchildren. “I’ll be going around the clock,” he says. The approach remains year-to-year. Whittingham will not be coaching when he’s old, although he immediately corrects himself with, “whatever old is.” He’s asked around, too, to former coaches about what the feeling might be like when it inevitably dawns on him. And everything away from football? Bluebird days at Snowbird or the mornings on the greens at the Salt Lake Country Club or twilight motorcycle rides or the weeks in Kaanapali? Were these all tests to see how he’d handle it when the time finally comes? He is practicing for the next step, but he is not ready yet. Because when Kyle Whittingham is on a beach in Maui, and the sun begins its slow drop beneath the horizon, turning the sky a radiant gold hue, even then, in those most vivid of moments, he can’t forget about football. But, he is getting better at it. It’s by design.